Dennis Public Library: "The Osprey Project"
The majestic osprey is one of the largest birds of prey in North America. Although their numbers dwindled in Massachusetts during the 1970s, the Cape’s population is now growing. Naturalist Dennis Murley talks about a monitoring project being developed by the Mass Audubon Society’s Wellfleet Bay Wildlife Sanctuary. 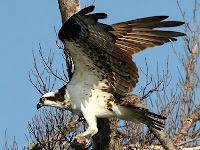 Would you like to help observe ospreys on the mid and lower Cape? Whether you want to volunteer, or simply learn more about these big, beautiful birds, come and join us!